I don’t know what “Ender’s Game” purists would make of this big screen adaptation, but as someone who has never read the book, I wasn’t impressed with the overall result. This is not to say that the movie doesn’t have impressive visuals. The futuristic settings, costumes and overall production design are a treat to watch. Hard-core fans of the series may derive so much enjoyment from the look of the movie, to overlook its shortcomings. It’s also fun to watch Harrison Ford as a tough Colonel who recruits young Ender (Asa Butterfield from the wonderful “Hugo”), a shy but brilliant boy to fight earth’s impending battle. What’s the downside? The movie has no personality of its own. It feels like a product constructed out of spare parts and assembled with computerized precision. Too many sci-fi movies in the past have earned a niche in history, mainly for their impressive visual effects (think 1982’s “Tron”). 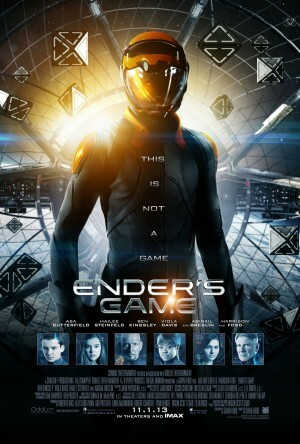 But in the 21st century, I don’t think a movie like “Ender’s Game” would follow in their footsteps. A lot of other current movies have put CGI to better use. This movie, on the other hand, feels untouched by human hands. It’s already available on DVD! Trust me. This wasn’t just a watered down version of the book, it was a water downed, kiddified version of the book. The book goes over multiple themes like politics, war, mercy and acceptance (ironic considering the author’s stance on gay marriage). The movie throws all of that out, changes every (and I literally mean every) character to fit a kid-friendly mold, and even shoehorns a romance where there wasn’t one by taking one of the toughest, most independent characters in the book and making her a ridiculously stereotypical action-girl love interest type. Harrison Ford’s character and Asa Butterfield’s Ender were the only two accurate characters in the book, not counting the brother and sister because they barely show up in the movie while they have their own subplot in the book. Thanks for clearing this up. I’ve never read the book so I wouldn’t know. I definitely needed an expert’s opinion.